Roxzy Mabry was born in Jacksonville, IL. She received her Bachelor of Science in Kinesiology from the University of Illinois Urbana-Champaign. Her medical training for Physician Assistant was at Nova Southeastern University. 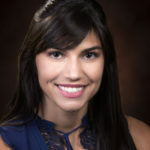 Physician Assistant Certified by NCCPA (National Commission on Certification of Physician Assistants), member of FAPA (Florida Association of Physician Assistants), and member of ACG (American College of Gastroenterology). She joined the practice in 2017.